In general, anything caramel refers to cooked sugar. In fact, you can make caramel in its purest form by simply boiling plain sugar on the stovetop. Caramelizations happens in nearly all baked goods without us even thinking twice about it - creating more developed flavours and aiding to the gentle browning and tender crusts on the outside of everything from cakes to quick-breads. To make caramel sauce, cream and sometimes a small amount of butter is added to granulated white sugar that has already been cooked to a medium-amber color. From there, you can add in vanilla and salt, or even a splash of bourbon. Trying infusing the cream with spices before hand for fall! Butterscotch, on the other hand, is made primarily with brown sugar. And as the name would indicate, a lot of the flavour comes from, you guessed it - Butter! Butter and brown sugar are melted together. To turn this into a sauce, cream is add before all the ingredients are then cooked together until the sauce thickens. Contrary to the name, it is does not contain scotch, but you may also flavour it with extracts, a dash of booze, and/or spices if you'd like. Toffee vs. Butterscotch. Now here is where I failed to get a straight answer. They use pretty much the same ingredients. However, if you bring the brown sugar + butter mixture to the hard crack stage, then it will turn into toffee candy as it cools. So then what is toffee sauce? Isn't it just the same as butterscotch sauce? Well, basically. The main take-away? Caramel is made with granulated sugar and must be cooked to a higher temperature. (Note - I am talking mostly about the saucy, pourable caramel and butterscotch - not the candy. Perhaps more on those in another post!). Also, the longer it cooks and the darker the color, the deeper the flavour. So what is the sauce that goes on Sticky Toffee Pudding? Liquid gold, is what it is! 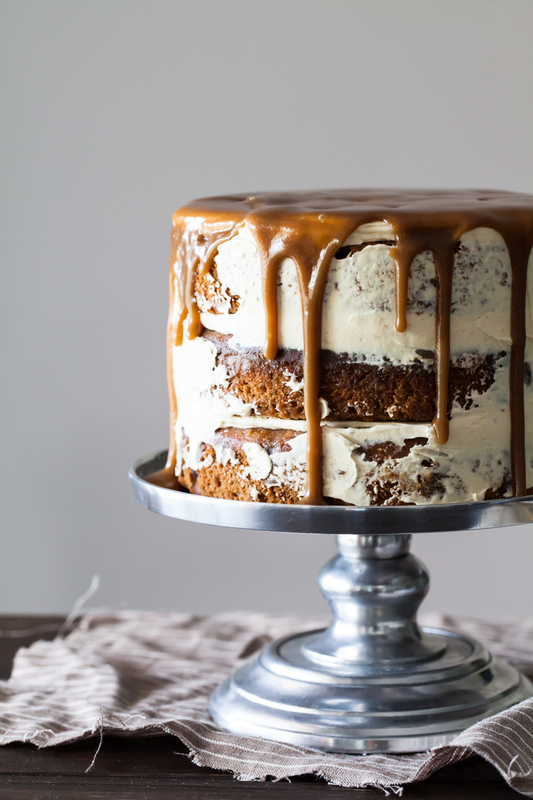 When poured over a brown sugar cake, warm toffee soaks into the cake layers making them extremely moist and even butterier. The cake is studded with dates that have been softened prior to baking. The natural, earthy sweetness of the dates combines beautiful with all the warm flavours and molasses from the brown sugar. 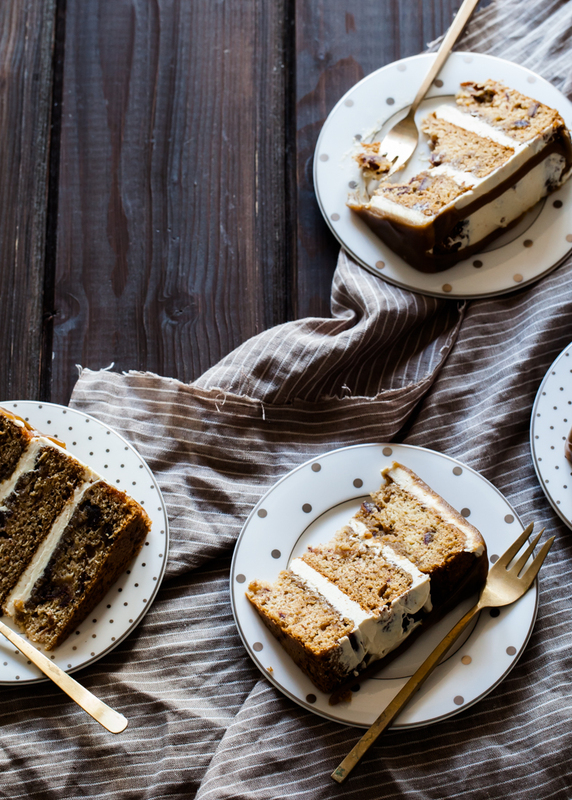 I've baked this date cake in regular cake pans then layered them up with Caramelized White Chocolate Buttercream to form my version of a Sticky Toffee Pudding Cake! This buttercream is absolute heaven. I'm not usually a fan of white chocolate, but caramelize it and it's dynamite! Are we starting to see a trend here, or what - hehe. You may use pre-caramelized white chocolate or "blonde" chocolate, or make your own! 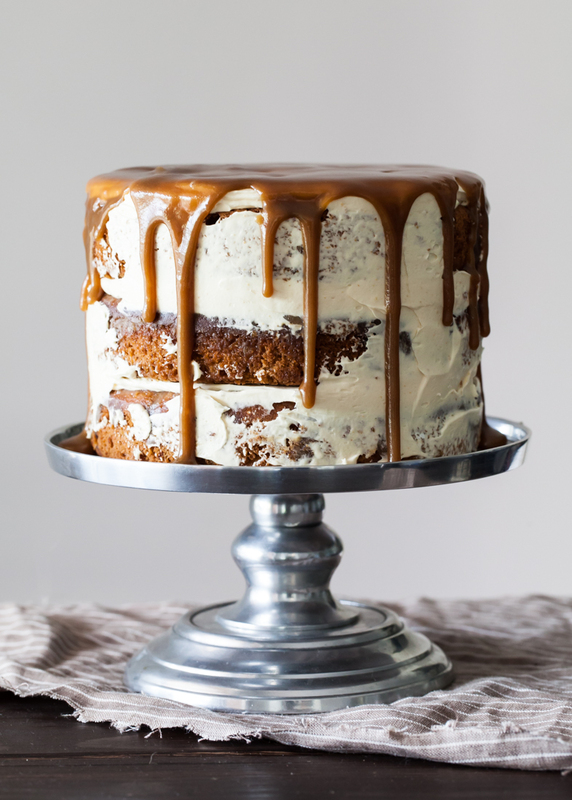 Be sure to reserves some extra Toffee Sauce to drizzle and drip over the top of the finished cake! Date Cake recipe adapted from Elizabeth Falkner's Citizen Cake. Preheat oven to 350 degrees. Prepare three 7-inch cake pans and set aside. Place the chopped dates in a heat-safe bowl. Stir the baking soda into the boiling water and pour over the chopped dates. Stir to loosen and set aside. In the bowl of an electric mixer, cream together the butter and the sugars for about 3 to 5 minutes on medium speed. Add in the eggs, one at a time, until combined. With the mixer on low, add in half of the flour mixture. Carefully stream in most of the water left with the dates. Add in the remaining flour and mix until just combined and the last streaks of dry ingredients disappear. Gently stir in the dates and any remaining water. Distribute the batter between the pans and bake for about 26 to 28 minutes, or until a toothpick inserted in the center comes out clean. Line a baking pan with a silicone mat (if you have one). Sprinkle with the chopped chocolate and bake for about 20 to 30 minutes, stirring every 5 to 10 minutes. Use a rubber spatula to stir and smear the chocolate until it becomes smooth and a light caramel color. Sitr in a pinch of salt when done. For every 2 cups of buttercream, stir in 3 to 4 tablespoons of the melted caramelized white chocolate. For a more thorough explanation plus photos, be sure to check out this postby David Leibovitz. Place the egg whites and sugar in the bowl of an electric mixer. Whisk by hand to combine. Fill a medium saucepan with a few inches of water and bring to a simmer. Place the mixer bowl on top of the saucepan to create a double-boiler. Stirring intermittently, bring the egg white mixture to about 155 degrees on a candy thermometer. Once hot, carefully transfer the mixer bowl back to the stand mixer. With the whisk attachment, whip the egg mixture until medium peaks - or until the outside of the mixer bowl returns to room temperature. Stop the mixer and swap out the whisk for the paddle attachment. With the mixer on low, add in the butter a few tablespoons at a time. Turn the mixer up to medium-high and mix until silky smooth. Place the sugar, cream, and butter in s small saucepan. Bring everything to a boil, then reduce the heat to a simmer. Let cool until desired consistency is reached. Once the cakes have cooled, trim them and then place them back in their pans. Poke holes in the cakes with a wooden skewer. Make or reheat the toffee sauce. It should be warm and fluid. Pour about half of the toffee sauce over the tops of the trimmed cakes. Let soak for at least 20 minutes. Save the remaining toffee for the top of the cake. Once the cakes are done soaking, spread on about 1/2 to 3/4 cup of the buttercream between the layers of cake. Ice the top of the cake to give the toffee a nice surface to drip from. Frost the sides of the cake with any remaining buttercream. 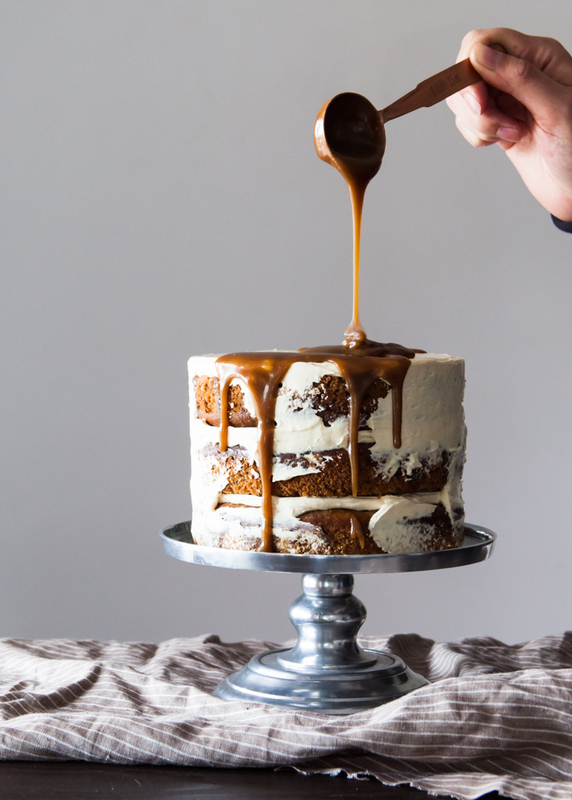 Pour cooled, thickened toffee sauce over the top of the cake before serving. Does anyone else know the difference between butterscotch and toffee? Be sure to leave you thoughts in the comment section below! - White the white chocolate cooks in the oven, it will go through a dry, crumbly stage. Keep stirring and smoothing against the baking pan. - If making in advance, re-heat the caramelized white chocolate in the top of a double-boiler before sitting into the buttercream. - The toffee sauce will become almost solid if refrigerated. To re-warm, place it in saucepan of hot water (I was afraid the glass might break if heated on the stove, but I'm not sure if this would actually happen - so use caution).